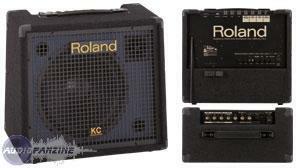 KC-150, Keyboard Amplifier from Roland in the KC series. Product replaced by the Roland KC-200. stompboxjon's review"Do not turn it up to loud"
I have been using the Roland KC-150 for a few small projects over the last 6 months. It is a very affordable keyboard amp that has a 12” speaker with microphone inputs and even an auxiliary input. There are only 65 watts in the KC-150 but it feels like its more, because of the 4 channel amplifier it really gives a nice big sound in such a small unit. You can use the KC 150 as a floor speaker or it can be mounted to an on stage stand. But I would be careful because this is not one of the higher end systems from Roland and it feels rather cheap in the way its built. The unit is not that heavy and I don’t think it can take much damage before it will completely break on you. The total weight of the KC-150 is just around 30 pounds and it has 2 ¼ outputs and 4 ¼ inputs with 2 RCA. If you are going to use this amp for a venue make sure it is a small venue because it just can’t handle to much. If you take the volume up too high it can get a little distorted with the sound, its almost like the higher you go the worse the overall crispness will be. I never have this issue at home just out in different places when It has to be turned way up. I have used this amplifier mainly with my Yamaha S90 XS and it works good, but sounds a lot better when using it at home. 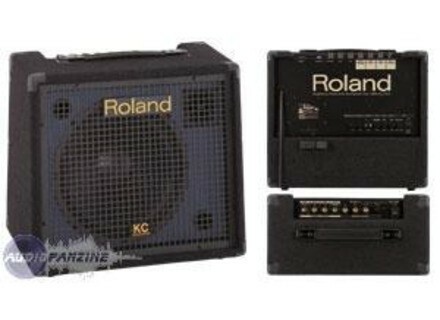 The price of the Roland KC-150 is the selling point. It is very affordable and can work great for your home personal needs, but if you are in need of an amp for venues and small clubs then I really wouldn’t go for the KC 150. There are better amps that will cost a little more , but will give you a better sound when cranked to high volumes. georgesbrasil's review (This content has been automatically translated from French)" KC 150 light and powerful"
Super light and super strong 65 w clear sound no effect transistor has 6 possible connections with RCA and XLR microphone input for portable or iphone! I just 2 weeks I aquérir ENSAI several models of other brands, but the sound and weight 14 k! e roulette no handle for transport, but not heavy price I pay 230 euros nine Woodbrass balances.